I remember watching Cleopatra for the first time at my best friend's house. We had to have been around nine or ten years old. Watching it back then was great. I loved every bit of it and it also made me a huge fan of Elizabeth Taylor. When I had the opportunity to watch it and review the blu-ray copy I was more than thrilled. Not only would I be watching one of my favorite movies I loved as a kid, but this time it would be with better quality, picture and sound and that it was. 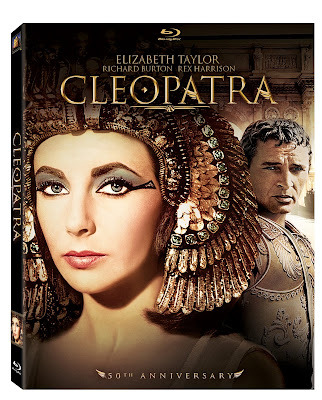 This blu-ray for the 50th anniversary of Cleopatra was all that I expected and more. Not only did I enjoy watching it again, but as did my mother in law. This is such a great movie that I'm looking forward to watching again and hopefully with my daughter when she's a bit older and can understand and follow the story. Cleopatra 50th Anniversary Edition is now out in stores for purchase! Just Us Girls is partnering with Fox. Two readers of Just Us Girls will have the opportunity to win their very own copy of Cleopatra on Blu-ray! Elizabeth Taylor had a very public love affair with what Cleopatra co-star? Disclosure: All opinions are my own. I received Cleopatra at no cost for the purpose of this review. No other compensation was received.